vintage workwear: Vintage FLINT Chore Coat with Chin Strap Mfg. by Schramm & Schmeig Co.
Vintage FLINT Chore Coat with Chin Strap Mfg. by Schramm & Schmeig Co. This beautiful FLINT coat made of ERWIN BLUSERGE DENIM just ended with a crazy final bid of $5,525... without meeting the sellers reserve. The coat was listed as circa 1915 which I believe to be incorrect due to the fact that along with the WWII war era wreath and star buttons, the label (not so) clearly states SANFORIZED. The SANFORIZED fabric shrinkage control process trademark was first registered in the USA in 1930. 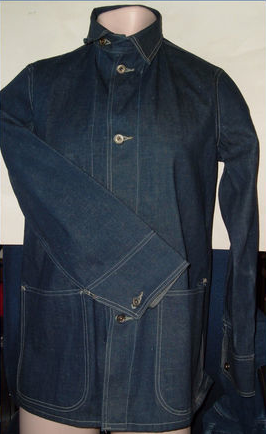 According to Paul Trynka the highly knowledgeable author & denim aficionado, whose book DENIM FROM COWBOYS TO CATWALKS was an early inspiration for yours truly, the SANFORIZED process was first used by Erwin Mills in 1936 to make denim for overalls marketed under J.C. Penney’s Big Mac label. 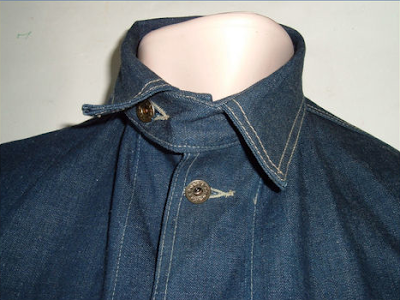 Just over one year ago we shared an ERWIN Blueserge Denim Coat that is part of the vintageworkwear.com collection. The coat along with a bit of history on the Erwin Mills can be found here. 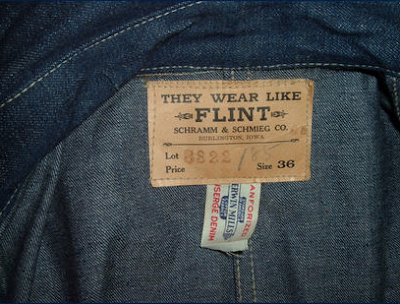 A nice piece on Flint Hill Overalls manufactured by Schramm & Schmieg Dry Goods Company can be found at the great blog UNION-MADE here. it takes two to tango...I'm guessing there are two disappointed right now...the seller and the bidder...GREAT jacket, bummer ending!.. 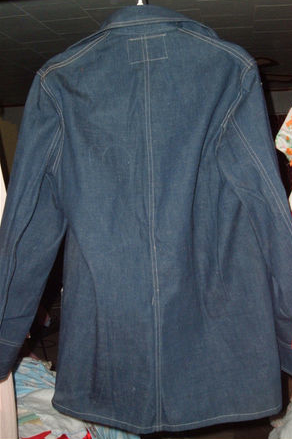 in their trademark application from 1947, erwin cotton mills claimed their earliest usage of the term 'bluserge denim' was june 3, 1936, so it's pretty much impossible for that jacket to be from 1915. i don't think the seller is intentionally being deceptive, they likely don't know (or care) about that detail. they are, however, being intentionally greedy. the way the initial auction ended, they were shilling for sure. I don't think they are being deceptive about the age of the garment, I think there is some hinky bidding and general funny business with the overall auction. Only two bidders? Not the usual suspect? Seems really odd.